Nextiva is one of the largest communications companies in the world, starting life as a VoIP provider but branching out into multiple products as the business grew. Founded in 2006, this Scottsdale outfit employs more than 300 people and has won awards including TMC’s ‘Communications Solutions Product of the Year Award’ twice in two years. It’s also Arizona’s fastest growing company and in the Top 100 for the country. The cloud storage product itself is relatively new, but is already winning plaudits among industry experts. Its simple and accessible interface is backed up by serious firepower and statistics that come together for a winning combination – bringing hundreds of new customers every day. ​Nextiva Drive is the company’s cloud storage solutions that is earning praise from all over, offering unlimited storage and super-high file sizes for uploads. It comes with both automatic and scheduled backups with seamless recovery. You can manage all of your files online through a web interface, or even through mobile access with apps on both the App Store and Google Play. Sync all of your devices to make sure you’re always up-to-date and even share your folders with colleagues and friends. You can access Nextiva Drive from anywhere and it’s not just management you’ve got access to through your smartphone, the software supports both iOS and Android backups. All of this is protected by 128-bit encryption that will lock your files down, everything is safeguarded by a ‘complete redundancy’ system and the datacenter is impenetrable. There’s no risk of any data interception from virtual or physical threats, security is something that Nextiva takes extremely seriously. There are two plans available, Drive Pro and Drive Pro Plus. The first costs just $9.95 per month when paid annually, but the second is only a little more expensive at $14.95 per month. It’s Drive Pro Plus that takes the prize for best plan here, as whilst most features are the same or similar; you have access to completely unrestricted storage size. This plan is perfect for people who work with large file sizes like photographers, designers and illustrators. If you sign up to an annual plan, you’re getting outstanding value for money. Both plans on offer are enterprise-level solutions at entry-level prices, so you can’t go wrong with either. Though as stated beforehand, Drive Pro Plus is the best option for performance. Drive Pro Plus Unlimited $14.95/Mo. 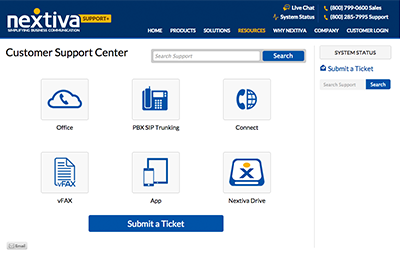 You can get in touch with Nextiva through their impressive online support center, which includes live chat, telephone support and a ticket system. If you’re looking to troubleshoot your own problem, you can take advantage of the live system status updates and the various sections in the company knowledge base. We contacted Nextiva with a few fact-checking questions for this review and received instant replies which were comprehensive and friendly. For those in the market for an affordable and easy-to-use cloud storage solutions, Nextiva Drive is the perfect product. With its complete mobile readiness, it represents everything that modern tech is striving for; making our lives as easy and as straightforward as possible. Fantastic features, low prices, high ease-of-use; what more could you want?